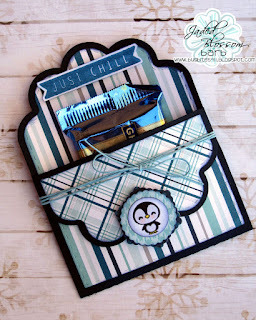 Today I am sharing a cool treat I did using a bunch of Jaded Blossom dies. I used a new Jaded Blossom Die released last week. I stapled two panels together to make a pocket for a chocolate square. I added a bow around the package and added a couple stamped images. A great way to use up scrap papers. Absolutely love this!! Definitely will be borrowing this fab idea!